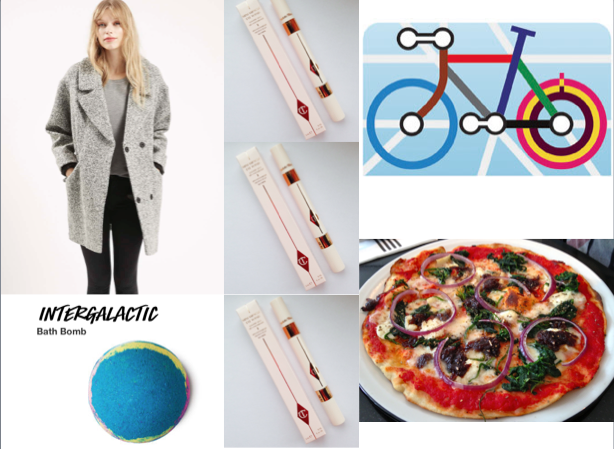 Weekend wind- up: New in from Charlotte Tilbury, cycling to work, bath bombs, coat swooning and pizza! It's that time of the week again where I gather together all of the things I've been up to, swooning over and let you know my thoughts. First up is this coat from topshop. I haven't got a grey coat and I have been searching for a new winter coat for a while now. This is the slouchy boucle wool blend coat £85. I definitely want to go and try this on in store next time I go shopping! I've also been finding myself taking more baths now the weather is getting colder. I lovely having a warm bath and then snuggling up on the sofa watching a film. This is my current favourite from Lush. It is the intergalactic bath bomb with peppermint, grapefruit, vetiver and cedar wood oil. When you put it in the bath it goes blue, yellow, pink and glittery- what more could you want?!? I've also been eyeing up the Charlotte Tilbury miracle eye wand that is due to come out tomorrow (Monday 21st September). I'm excited to try this. Apparently it took 5 years in the making and creates the appearance of 8 hours sleep! It comes in 5 shades and has two ends. Have any of you been able to have a sneaky peek? What do you think? I have also been cycling to work. At my last job it was only 1.3miles away so cycling was a doddle. My new job is 9.1 miles. I hate relying and travelling on public transport in London because if there are any delays, I'm late. On the bus, 2 trains and walk route (Yes that's right!) it takes 1hour 15minutes with no delays. The cycling route takes 1hour 5minutes so I am already getting there faster. I hope to cut this down a bit as I get used to the longer commute but I am really proud that I am doing this. Hopefully it will be good for my waistline too! Lastly, I met up with a few old work colleagues at Pizza express. I had the Padana pizza which was delicious and possibly the best cheesecake I've ever had. The honeycomb cream slice. I seriously recommend trying this next time you go to Pizza express- it was to die for!